A L Tyres are one of the leading commercial and industrial tyre and casing specialists in the United Kingdom. We offer a range of services from our comprehensive Total Tyre Management services to our simple straightforward sales, purchasing and reconditioning services. With our TTM services A L Tyres offer a complete range of tyre management services on a special contract basis. This allows our customers to select the tyre management services best suited to their requirements and combine these with a special individually negotiated monthly contract, one of Fixed Price, Pay As You Go, or Price Per Mile/Kilometre. We stock all leading brands of new and used truck and commercial vehicle tyres. Also we buy and sell tyre casings. 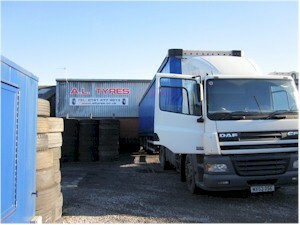 A L Tyres operate in the UK and internationally and run an efficient delivery and collection service. To obtain a personalised quote just phone (Adrian, Simon or Matthew on +44 (0)161 477 5813), fax, or email us. Use the Contacts button for full details.